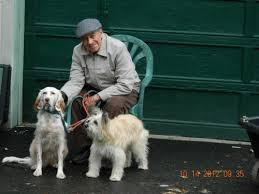 James Petras’s dogs often make cameo appearances on Truth Jihad Radio. First half hour: James Petras discusses his article Clinton Promotes War While US Public Opinion Speaks to Anti-Militarist Populism; and Kevin and Jim argue heatedly over the merits and demerits of Donald Trump. Today’s show is an encore edition from 11-21-2016 as Kevin is on a working vacation. Second half hour: Kevin appears on Radio Islam to discuss whether the Simpsons prognosticated the Trump presidency and other issues; then tells the American Muslim Political Action Committee (AMPAC) that Muslims have made a terrible mistake by not working hard enough to debunk the mainstream myth of 9/11 and other false flag big lies. This show was broadcast on November 28, 2016. This entry was posted on Sunday, November 27th, 2016 at 8:14 pm	and is filed under Anti-War, Censorship-Propaganda, Education, Freedom, Geopolitics, Human Rights, Immigration, Justice, Kevin Barrett, Law, News, Politics, Protest, War Crimes. You can follow any responses to this entry through the RSS 2.0 feed.